Holger Grüll studied chemistry in Cologne, Germany, and gained 1996 his PhD in Physical Chemistry. After his PhD, he was working several years as postdoc and guest researcher at the Ben-Gurion University of the Negev, Beer Sheva (Israel), the National Institute of Standards and Technology (NIST) in Gaithersburg (USA), and again the Ben-Gurion University of the Negev working on polymers, nanoparticles, biomimetic membranes and drug delivery systems. In 2000, he started his career at the Philips Research Laboratory in Eindhoven, The Netherlands, and became later responsible for the in vivo research on molecular imaging and therapeutic applications. In 2007, Dr. Grüll was appointed professor at the Eindhoven University of Technology holding a chair for Molecular Imaging and Image-guided Interventions. 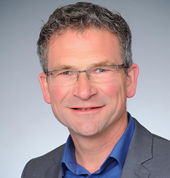 In 2016, Dr. Grüll received an appointment full professor at the department of radiology, University Hospital Cologne, where Dr. Grüll is heading the laboratory for experimental imaging. Main research areas are nanoparticles for imaging applications and drug delivery with main focus on high intensity focused ultrasound applications, temperature sensitive liposomes, magnetic nanoparticles and particles for spectral CT application in cancer.